If you spend time around CNC machining, you’ll likely encounter the phrase “speeds and feeds.” Finding good speeds and feeds is critical to any machining project, but it can feel daunting if you’re just getting started. Luckily, following a few basic principles can make the process much easier. In this guide, we’ll introduce some of the concepts behind speeds and feeds and share some pointers to help you get the most out of your Bantam Tools Desktop PCB Milling Machine. Finally, we’ve put together a list of recommended speeds and feeds for some common materials to get you started. What are speeds and feeds? “Speeds and feeds” are the collection of settings that determine the way in which a milling tool moves through material. Typically, machinists enter their speeds and feeds into CAM software (such as Otherplan or Fusion 360), and the CAM software combines the speeds and feeds with the geometry of the tool to determine the final toolpath. Why are speeds and feeds important? Milling is a physical act that drives a sharp, rapidly-spinning tool through a piece of material. Depending on the the type of material and tool you’re using, you’ll need to use different settings to mill successfully. Here’s an analogy: imagine using a small pair of scissors to cut a hole in a piece of paper, wood, and aluminum. Think about how hard you would have to squeeze the scissors for each material, and what the end result might look like. Then, think about using a bigger pair of scissors. The amount of force needed to cut each material is different, and it changes based upon the size of the tool. The same thing is true when using a milling machine. The type of material and the size of your tool changes how much force you need and how fast you can go. Feeds and speeds are the way to control the forces on the tool as it is milling through a material. Ultimately, optimizing your speeds and feeds will result in milled parts that are precise, smooth, and look great, without breaking your milling tools. What are the common settings used when configuring speeds and feeds? These settings are used when entering custom tools in Otherplan. What factors affect how speeds and feeds should be chosen for a given project? There are a number of key factors that will affect the optimal speeds and feed for your project. Your tool: (size, shape, material, and sharpness) the bigger the tool, the more material it can mill at once – so the faster it can go. Similarly, the type of metal used to make the tool and the shape of the tool (flat, round) will affect how much material can be milled at once. Material: Typically, hard materials require more force to mill. Compared to soft materials, less volume must be removed on each pass. Fixturing: The more secure the material is, the less it will vibrate and the faster it can be milled. Toolpath type: The direction in which the tool mills will affect how much it can mill. For example, milling with the side of the tool is different from milling straight down with the tool. Because of all of these factors and more, there’s no one-size-fits-all list of speeds and feeds. Every project is different, and it may require some experimentation to find the settings that work best for you. Ultimately, what matters is that you end up with a milled part that meets your specifications. Once you know how each input contributes to the end result, it will be easier to fine-tune your settings and get the part you’re looking for. While professional machinists often take the time to calculate and optimize each setting, most users can get away with a bit of experimentation. Instead of worrying about every single factor, start with your best guess and experiment. You might break a few tools along the way, but you’ll quickly develop an intuition for speeds and feeds. In my research on speeds and feeds, “chip load” always seems to come up. What’s the deal? Many professionals choose speeds and feeds from calculations based on the underlying physics of milling. Calculating chip load is one of the ways machinists set a baseline for where they will start when dialing in their speeds and feeds. Essentially, chip load is a number that represents the amount of material that each flute of your tool cuts on each revolution. It’s a useful number to optimize for: if chip load is too big, the tool will break. But if chip load is too small, the tool can rub and quickly become dull — this is one reason why slower is not always better! To use our scissors analogy from before: if you use your scissors to make a lot of tiny cuts, they will wear out quickly. Instead, it’s often preferrable to use fewer, larger cuts. You’ll cut the same material, but with better results. If you’re interested in learning more about chip load, this article from CNC Cookbook is a great primer. What happens when speeds and feeds are optimized? When speeds and feeds are dialed in, you’ll end up with precise parts that have a consistent surface finish. During milling, vibration and noise will be minimized, you won’t break tools, and the overall milling time should be optimal for each part. What happens when speeds and feeds are suboptimal? Poorly-optimized speeds and feeds can break tools, cause tools to get stuck in material, and can cause premature wear. You can end up with parts that have poor surface finish, take too long to mill, and cause the milling machine to be noisy. How are speeds and feeds different on the milling machine compared to other CNC mills? If you speak with experienced machinists, you’ll often hear rules of thumb related to speeds and feeds. As an example, one common rule is that the plunge depth should always be half the diameter of the tool. While this conventional wisdom can be useful, it’s important to remember that themilling machine is quite different from many conventional CNC milling machines and the same rules may not apply. In particular, compared to a traditional large-format mill, the milling machine’s low-torque spindle works best with small tools at high spindle speeds and low pass depths. As a result, typical speeds and feeds recommendations may need to be modified, especially when milling hard materials. What are resources for learning about speeds and feeds? The Guerrilla Guide to CNC offers a great deal of information on toolpath types. What are the configuration options for speeds and feeds? While terminology different in every CAM program, these are the most commonly used speeds and feeds settings, and the settings used by Otherplan. This chart shows the range of possible values for each model ofmilling machine. What approach should I use when trying to find speeds and feeds? Research the material. A Google search for “[the name of the material] machinability” is a great place to start. It’s helpful to know the hardness of the material, how brittle the material is (brittle material, to a point, is often easier to mill), and if there are any other considerations to be aware of (for example, some plastics can easily melt). Look in our Materials Guides for a similar material. While our guides are limited, they can offer a place to start. For example, if you are planning to mill PTFE, start with the speeds and feeds for Delrin. Choose speeds and feeds to test. Modify your initial values for speeds and feeds based on the differences between your material and the material in our materials guide. If it is harder, try milling at a lower pass depth or spindle speed. If it is softer, try milling faster or deeper. Mill a test part. With a new tool (if possible), mill a small test part, with the same type of toolpath you plan to use on the final part (i.e. a 3D contour, a pocket, or a cutout). The tool may have been milling too deep into the material. Try dramatically reducing the pass depth. If the tool still breaks, you could try lowering the stepover to further reduce the amount of material that the tool engages with on each pass. If the tool breaks yet again, try reducing the feed rate to put less stress on the tool. Once you’ve found a combination speeds and feeds that is successful, you can focus on surface finish. Try slowly increasing the values you reduced, until the milled area appears smooth, and the milling machine’s vibration and noise is reduced. Use your ears! Sound is one of the best ways to dial in speeds and feeds. Repeat testing until your results are satisfactory. Sometimes it takes a few tests before the perfect settings are dialed in. Although every project is different, using an experimental process like this will allow you to quickly determine ideal speeds and feeds. 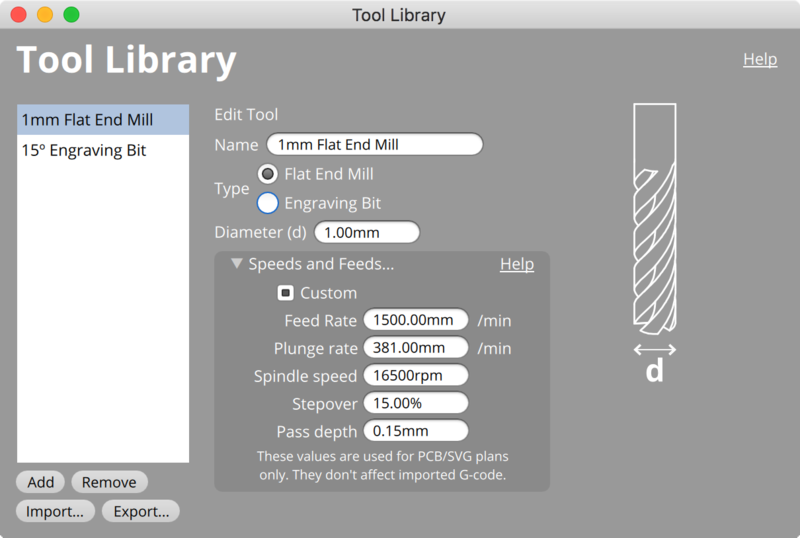 How do I edit speeds and feeds in Bantam Tools Milling Machine Software? Click on the tool for which you wish to edit the speeds and feeds. Click Speeds and Feeds to show the speeds and feeds options. Enter your speeds and feeds. Once your speeds and feeds are entered, they will save automatically. For G-code, edit speeds and feeds in your CAM program. Our software will use the settings in your G-code file, not the settings of the cutting tool selected in Bantam Tools Desktop Milling Machine Software. Feeds and speeds are used as specified regardless of the model of milling machine connected. If the specified speeds and feeds are outside of the acceptable range for the model in use, they will be capped at the minimum or maximum allowed value for the settings. The speeds and feeds for the default tools are not editable. The default tools are optimized for milling FR-1 PCB Blanks. For the full list of recommended speeds and feeds, go to the material page for the material you'd like to use. Each material page discusses milling properties and recommended speeds and feeds. To make it easier to use these recommended feeds and speeds, we’ve created a way for you to quickly import into our software all the settings you see listed below. To download the custom tool library file, go to the material page listed below. To learn how to use this file, check out our Custom Tool Library page.